Reputation management companies should be doing two essential tasks for your restaurant; social listening and generating positive feedback that then helps you bring in potential clients. Hiring an outside agency can be a difficult process. You know the time it will save is exponential but don’t want to risk questionable tactics that will only drag you lower in generated search results. Kulture Konnect would like to offer 5 companies that are ahead of the game and offer real results. 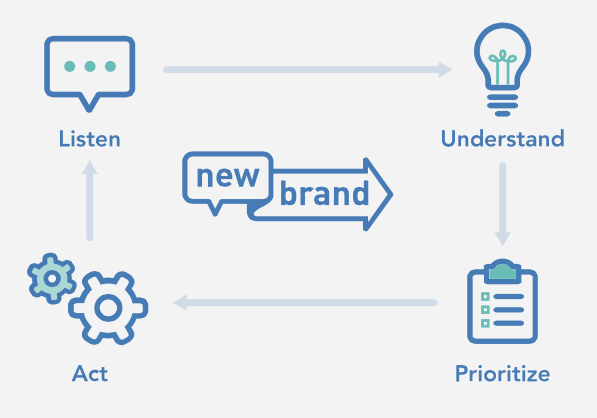 New Brand Analytics does more than just manage, they help you build your business and get more customers. Thier software analyzes current data, and can also more accurately predict certain business metrics such as buying behavior, and location performance with their Predictive Analytics feature. This company allows you to personalize your customer’s experience and give you insights with an accuracy rate of up to 95%. The Social Station is really just that. Their services rely heavily on interacting with the online community to turn them into potential customers, and get people through your doors. They provide social listening, and inform you when your attention is needed. The Social Station does the interacting for you by generating unique posts with their Social Booster feature. They send you detailed information about the people checking you out so you can better target your market with the Social Signal feature. Yext offers a Power Listings service that can update your business’s location across 100+ global partners, including big sites such as Yelp, and Facebook. Their Pages feature allows you to control content (including location) for multiple business locations, making updating content more accessible and manageable. Paired with their Xone feature, customers can easily get quick information like special offers or wifi options when looking at your restaurants listing. The rate at which information is syndicated makes its SEO capabilities a competitive service, however, the lack of social interaction offered is a drawback. Review Pro's services focus heavily on improving ratings and increasing positive content on review sites. As far as online reputation goes, they are solely focused on getting more positive content on the internet to establish a good reputation for individual and chain restaurants. 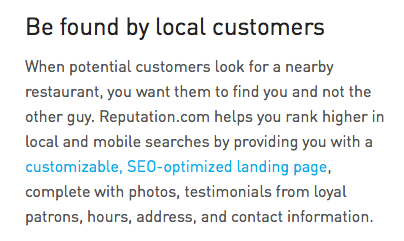 This includes social listening and notifying you of negative reviews and being proactive in delicate situations. If you are mainly looking to increase reviews, this might be the solution you are looking for. Reputation.com has an easy to use interface that lets you control much of the content that your customers will see. The site will create an enticing landing page with interactive content and keeps all of your analytics in one place for convenient reviewal. This is the option for someone who just needs a little help gathering information but wants total control personalizing and posting on their existing social media platforms. It also allows you to post from one dashboard opening up more time to focus on the posts by eliminating the constant toggling between tabs.